And my grandma, even before that! And carry forward the family hat! Since birth, till this day! Wonder, how she did this year after year! Showing up every time, like a beautiful fay. With a new shade every time! With a new pattern every time! Hugged me, when in doubt! Will I be able to do it, day in and day out? Well, I wish to, in all my zeal! Sarees do bring out the beauty… Loved reading about your affair with sarees 🙂 I am really bad at carrying it. Totally agree with you. Once I started wearing them, quite often I started carrying it pretty well and infact I enjoy myself more when am in saree. & glad to connect !! 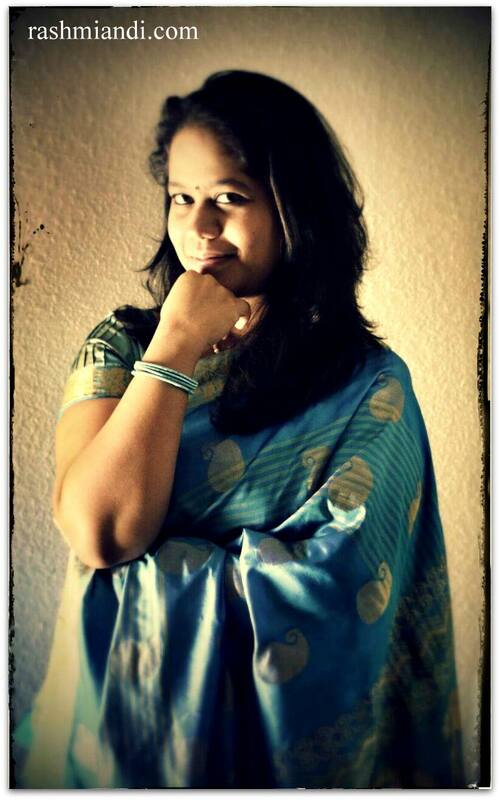 I am pretty crazy about sarees myself, though I dont get much chance to wear them. Lovely poem. Superb ! The way you’ve described the sari is commendable. Lovely ode to the sari! I love wearing one, but haven’t mastered the art of tying it! Utpal Kant Mishra recently posted…Love! Thy shade is bliss. I too love Sarees but it delayed my getting ready for a party which annoys my Hubby. I am bad at making plates. I am now finding an easy way to wear them- getting them stitched to save in time. BTW a nice poem on these 6-yard lovelies. Nice one on sarees.Love sarees and I have a big collection of them. Simply beautiful Rashmi! I love your beautiful interpretation of what the sari means to you. I totally agree that when one drapes a sari, one feels so wonderful, it’s just the effort and patience it requires that keeps us from donning it on a regular basis. Btw you look lovely in it! Thanks Kala:) yes all u need is a little effort and patience.